Hawthorn trees are part of the Rose family, comprising a group known as Crataegus, which encompasses over 100 species, states the Missouri Department of Conservation website. Even experts have a difficult time recognizing one type of hawthorn from another, especially when the trees and shrubs lack leaves in the winter months. Hawthorns are small trees that typically take over pastures, fencerows and old abandoned fields. Hawthorns take their name, says the Ohio Department of Natural Resources site, because haw is a name for fruit, and the trees feature thorns. These thorns can be as long as 2 to 3 inches in some instances. When planting a hawthorn as an ornamental, take into account if anyone is going to come into close proximity to the tree, since the thorns can then come into play. Take care pruning and mowing around a hawthorn tree as well, as the thorns are a distinct hazard you will want to avoid. Two of the main features of the hawthorn species are their flowers and their fruit. 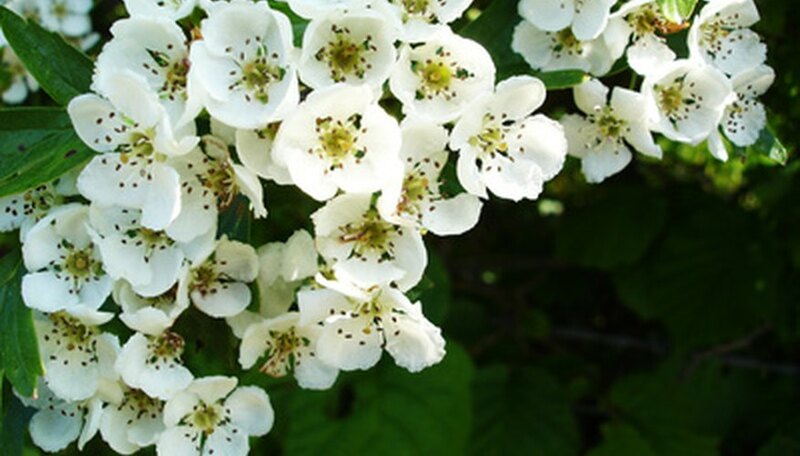 The vast majority of hawthorns produce a cluster of five-petaled blossoms at the tips of their branches. These flowers are fragrant, so aromatic that they can overwhelm an area, making it prudent to keep a hawthorn some distance from your open windows. The flowers are typically white to pink in color. The fruit is dry and “mealy,” according to “Trees of North America,” resembling a miniature apple. The fruits will hang down from the limbs or grow upright on the branches, depending on the species. Hawthorn trees are not at all difficult to grow. Most want to be in an area receiving full sunshine and hawthorns in general prefer soil with a neutral or alkaline pH level, although most species are adaptable to acidic soil. The hawthorns need well-draining locations in which to grow. Like the closely related apple trees, hawthorns have a number of insect pests that can do harm to their health. The hawthorns and their many cultivars have several uses as ornamentals. The tree is an ideal specimen species for small yards since they seldom exceed 30 feet in height. The showy flowers in spring and the autumn colors of the foliage on some of the hawthorns bring attention to the tree. Hawthorn trees are also useful as screens, planted next to one another to provide privacy or form a property border. By pruning a series of hawthorns, you can create a hedge. An added benefit is that the fruit of many kinds, such as fleshy hawthron and riverflat hawthron, is edible, with some people using them to create jellies and jams.